Good day, it’s been awhile since I last blogged a start-to-finish illustration. I’ve been at my new job for two months now and am getting into a groove for illustrating after work. This first piece was both a headache and a breath of fresh air because it’s basically setting the style standard for what will be in my portfolio (30-40 works). I’ve been wrestling like crazy with what I want it to look like vs what ends up coming out of my hands. I guess I’ll play to my strengths and see what happens from there. With that said, here is the process for the illustration, “Cosmic Thirst”. 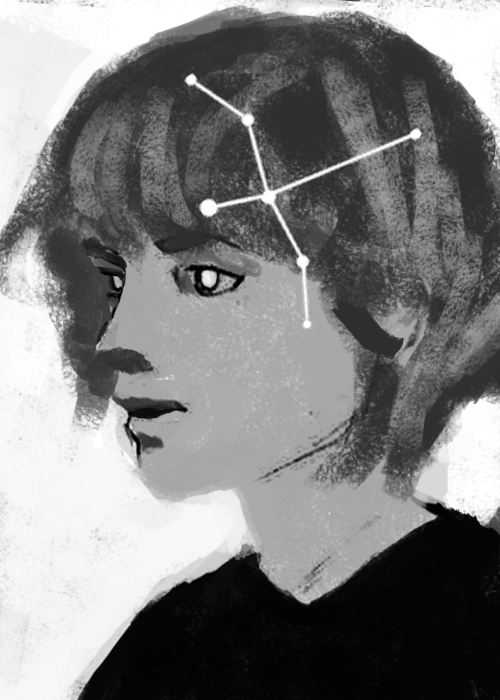 I wanted to do something with a figure and constellations, so I came up with three thumbnails to explore the idea. Ended up going with number three and began working on a detailed sketch. Okay, I’m going to get technical here and talk about something I discovered with the tools I’ve been using. I love working in pencil. I love the range of tones you can get with graphite and enjoy the absence of color because it forces one to focus on value relationships first and foremost. At this point in the image above, I’ve been working with a 0.5 mechanical pencil. Trying to fill in that white space with even tones is taking longer than I anticipated. I’m getting cramps in my wrist and need to take frequent breaks. I’m getting slightly frustrated, but am determined to get those smooth tones no matter what it takes! …it’s still taking too long. I finally wise-up and ask the internet for help. Googled “smooth pencil tone techniques” and found the most brilliant method ever. Rub a charcoal/black pastel stick on sandpaper, collect the dust in a disposable cup, take a fine brush (watercolor brushes work fantastic!) and methodically cover the areas of the paper you desire. Voila. Now that I’ve gotten the areas filled in, it’s time to refine. Played with color for a while. Was liking the look until I asked for feedback and received some constructive criticism. The hands are okay, but they’re lacking the strength of secondary interest in the initial thumbnail, so I changed them. Added stars in the background, bumped up the contrast, and changed the color to resonant better with the overarching theme of water and thirst. And there you have it. I had a little Mood Board created to keep me focused on the what the piece should ultimately feel like. I encourage you to make your own mood boards as they're fun to create and helpful in keeping you on track with the message you want your piece to tell.